Item # 312267 Stash Points: 2,499 (?) This is the number of points you get in The Zumiez Stash for purchasing this item. Stash points are redeemable for exclusive rewards only available to Zumiez Stash members. To redeem your points check out the rewards catalog on thestash.zumiez.com. Channel your inner fisherman with the Recon Bucket Hat from Dravus. 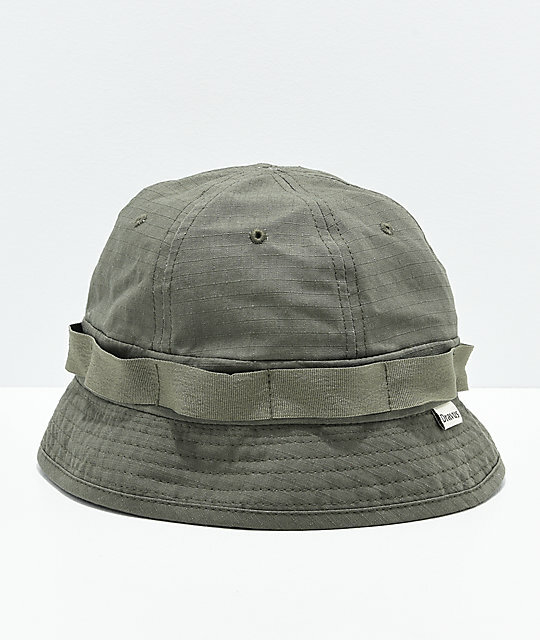 This army green, cotton ripstop bucket hat features a six panel construction and soft brim for a classic silhouette. The design is complete with webbed strap stitched around the crown for a versatile design that is fit for any mountain or street adventure alike. Recon Bucket Hat from Dravus. Woven brand tag at brim seam.